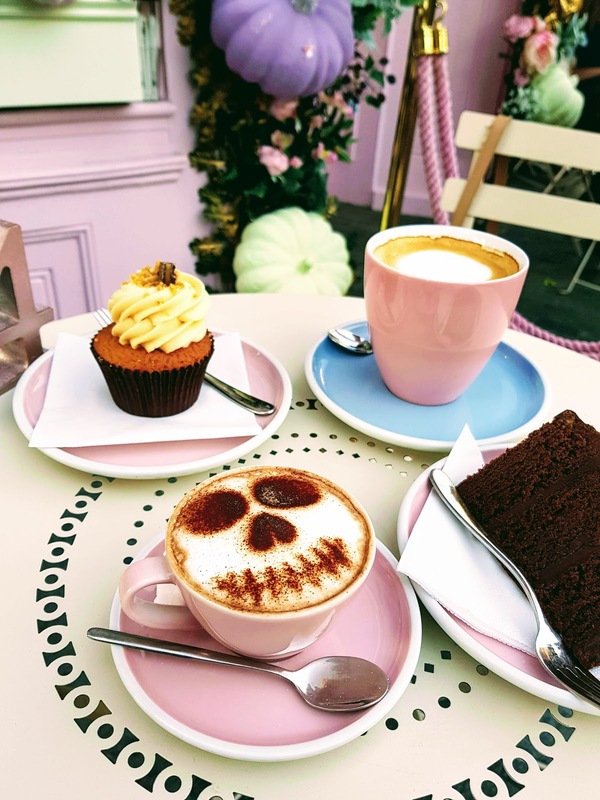 It's October guys and I am panic cake eating because winter is coming and it will get dark at 4pm and I will go into hibernation like a small rodent like animal. So I decided to go on an ultimate pink tea party jaunt before the rain and darkness comes for me. Here is everything you need to know to plan your visit. Price: On average £10 per person. I ordered 2 hot drinks and 2 slices of cake which came to just under £20. Cuisine: Cake. 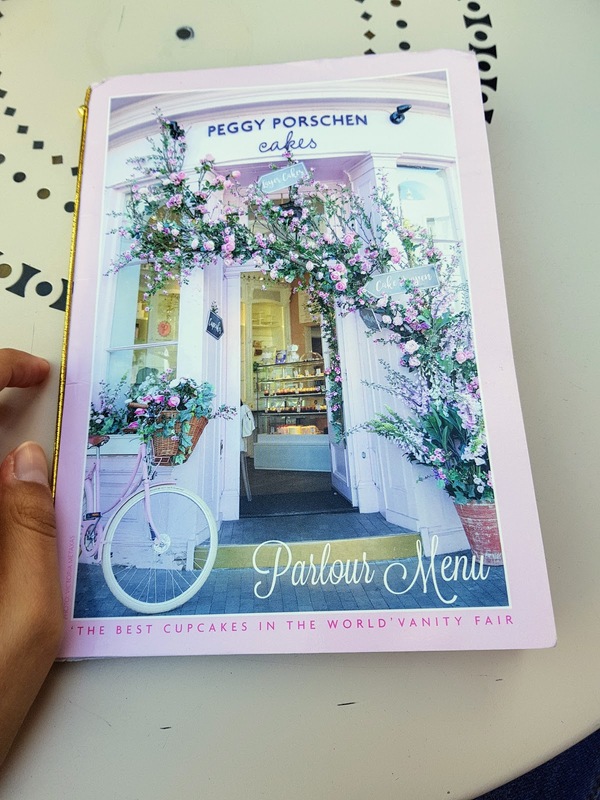 Peggy Prorschen is famous for its cupcakes, they also do layer cakes and tray bakes. Dietary Requirements: Vegetarian and gluten-free options are available however vegan options are not. 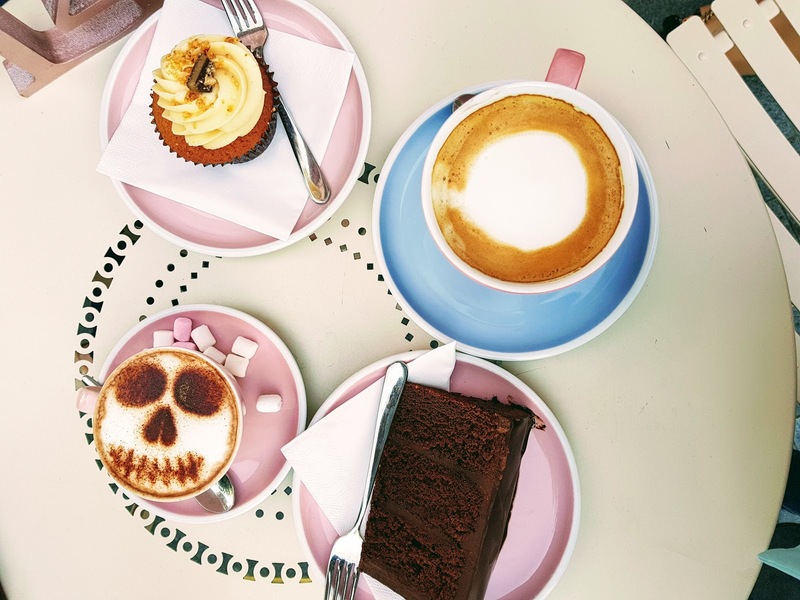 Perfect For: A tea party. Key Tip: If you want to avoid a long wait to get a seat plan your trip for after 6pm or before 12am when it's quieter. 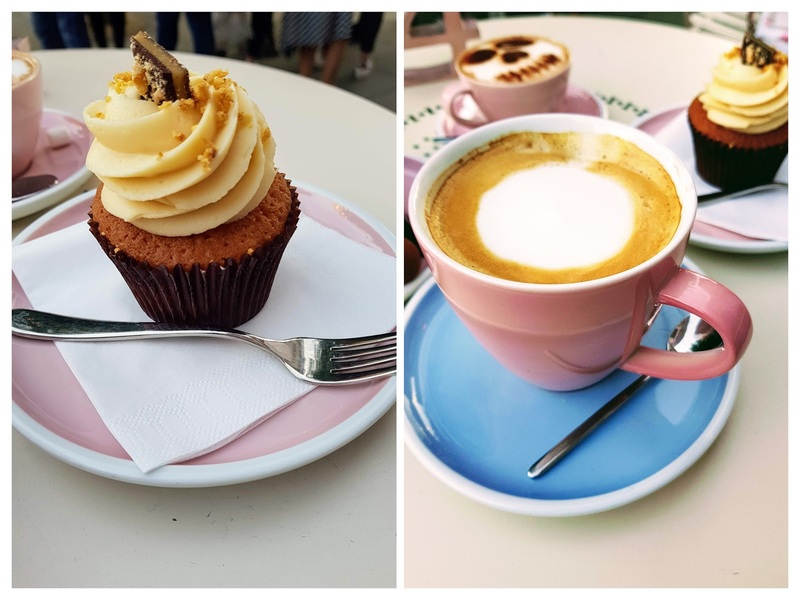 Peggy Prorschen is famous for its fabulous cupcakes but more than that it is famous for being the pink café which has taken the concept of "flower-power" to the next level. It attracts plenty of tourists but also plenty of Londoners and you can see why. 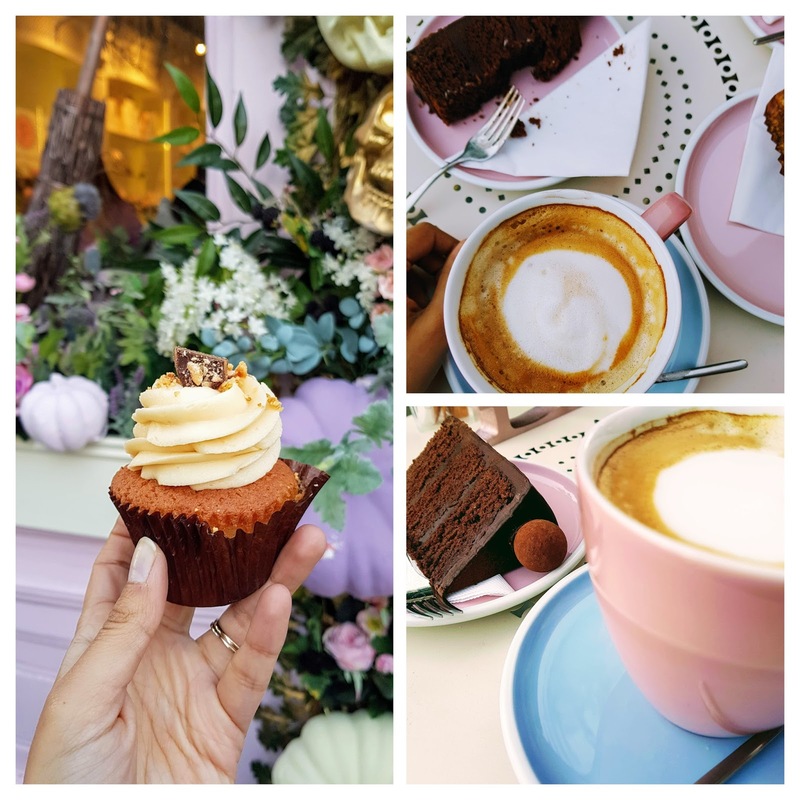 It's one of the most instagramable cafés in London so don't be surprised if you see full photo shoots taking place and many people "coincidently" wearing perfectly colour coordinated outfits to match the building (they are clearly higher up on the blogging food chain than I am - I should have tried to make friends but...yolo cake). My visit was in October and, by a mini-miracle, London was still mild enough to sit outside. 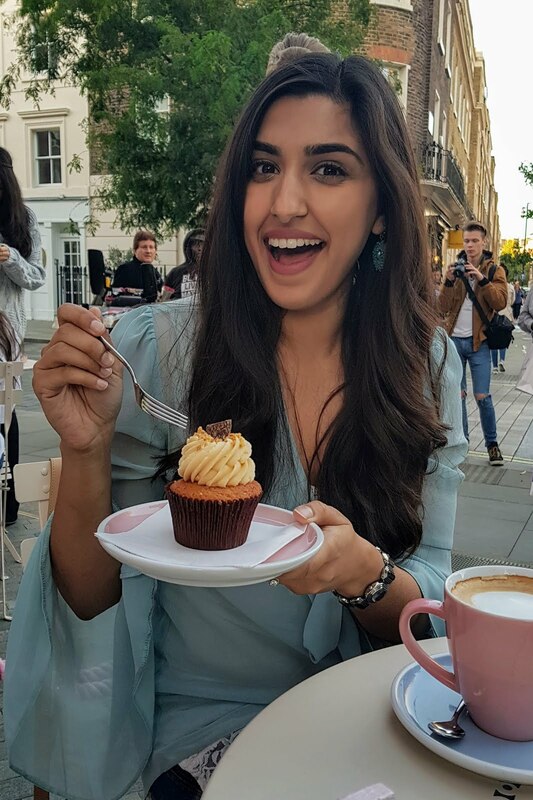 I'm panicking about approaching winter and I wanted to fit in as many alfresco moments as possible (yes, I am panic cake eating). 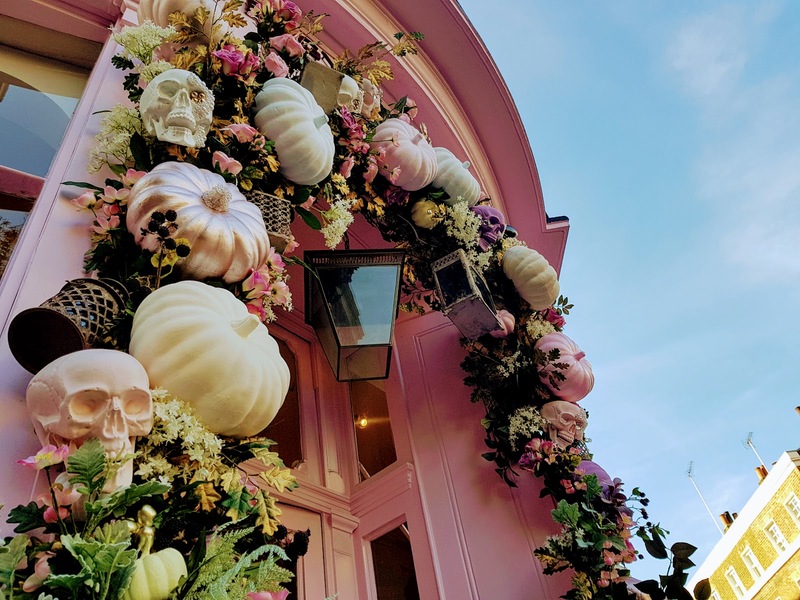 Peggy takes all holiday seasons seriously and dresses for the occasion so the place was kitted out for Haloween. 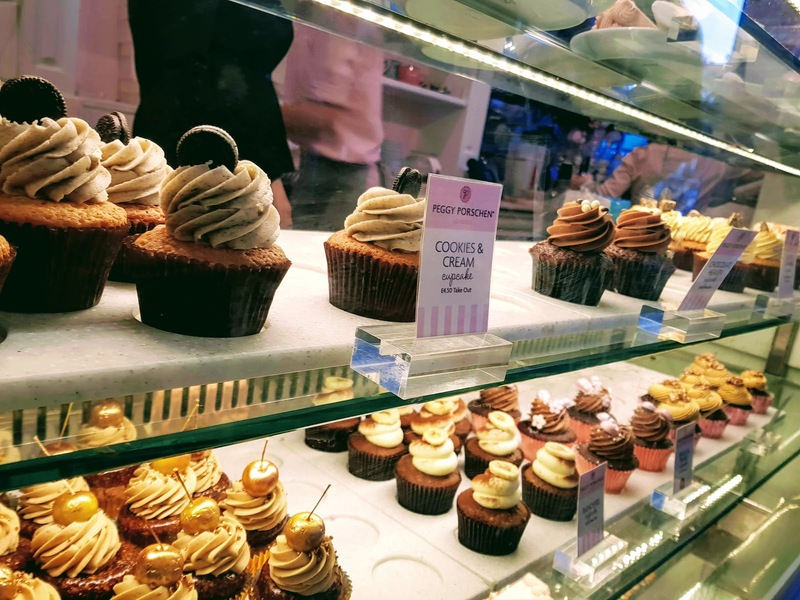 The café also launches cake collections inspired by the season all while keeping its classic cupcakes and favourite flavours. 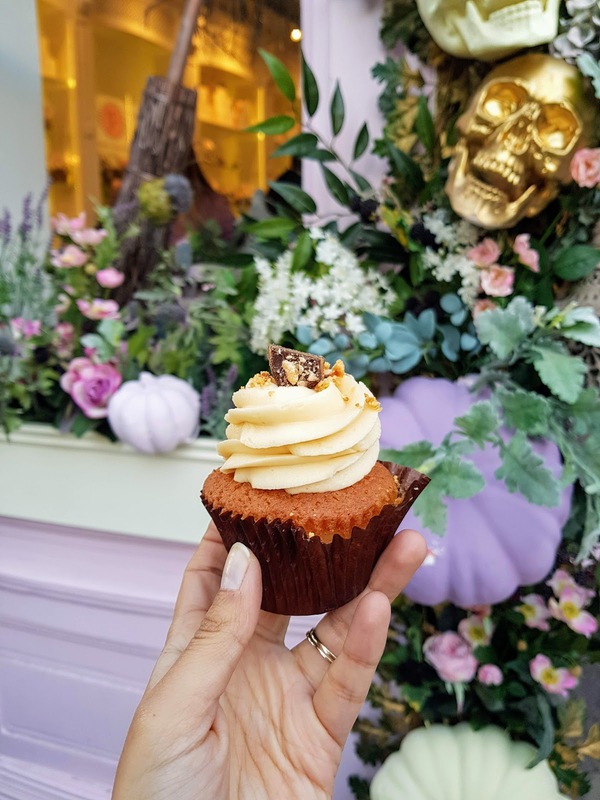 So don't worry, you won't be faced with pumpkin cupcakes and you can still enjoy amazing chocolate cakes and salted caramel cupcakes - but with a little spooky touch. 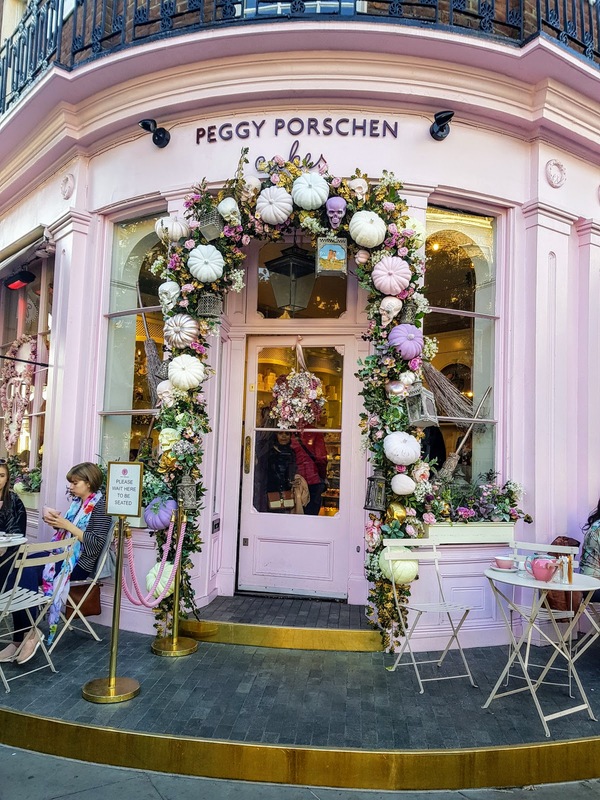 I spent an hour in the queue outside Peggy Prorschen (yes an hour - such is my dedication to cake). I joined the queue at 4pm on a Saturday, which is a peak time, and was there until 7pm. After 6pm the queue halved, so if you don't want to be stuck waiting, consider going a little later in the day or before 12 noon, which is also a quieter time (breakfast cake anyone?). Thankfully, you don't have to wait in the enormous queue if you are buying cake to go. In that case, you can pop straight in. The place was packed, but at least the queue was moving a lot faster. After waiting for an hour I was SO ready for cake. Maybe that's why this place has such a great reputation for cake - they make their customers work for it, all the while watching all sorts of gorgeous cake orders come out one by one. Luckily it was good weather, but it's something worth noting if it's cold and rainy - there is no inside waiting area. In fact, the place is a bit like a reverse Tardis, it looks huge and spectacular on the outside, but is surprisingly small on the inside and you can't book tables. 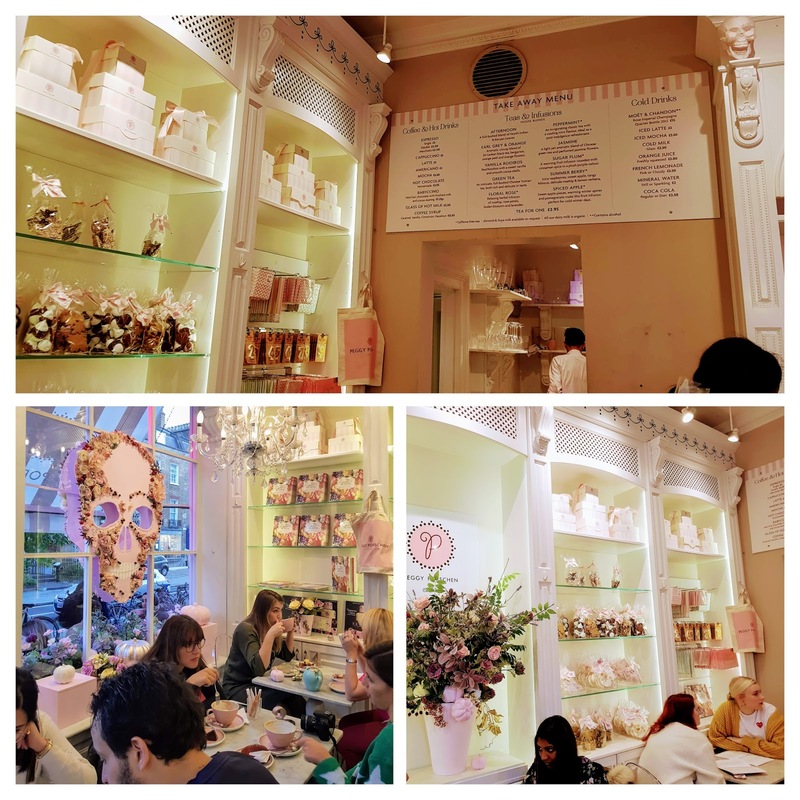 While the exterior of the cafe is spectacular, the inside is pretty but relatively plain. 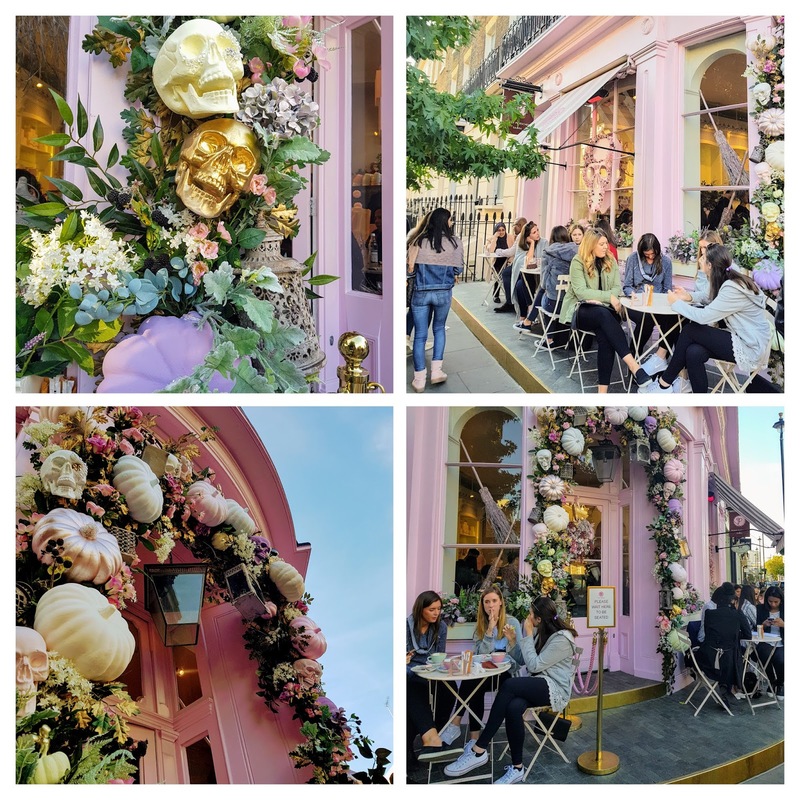 The café has outdoor seating and seeing as the real charm of this place is the amazing floral decor if you can, try and opt for an outdoor seat. If I am completely honest, it's a bit of a stretch to say Peggy Prorschen is the best cake in the world. I'm comparing it to places across the pond mind you, such as Levain (which definitely does the best cookies in the world - watch out for that post). But also I've had better cake in other, underrate places in London. That's not to say the cake isn't good. It definitely is and you won't be disappointed with your order. 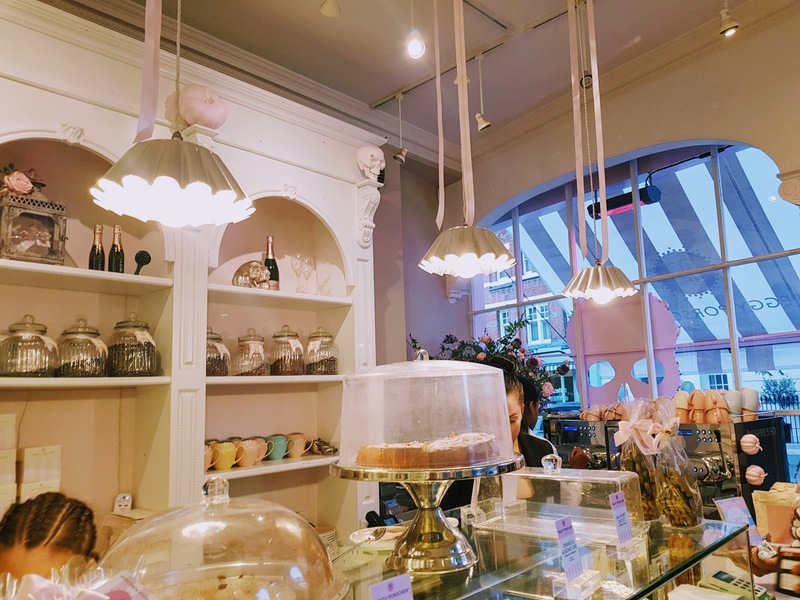 Plus, Peggy Prorschen's appeal is not just the cake, the decor is a huge part of why this place is a great spot to visit. The prices are perfectly reasonable as well and only slightly more expensive than nice cafés in central London. 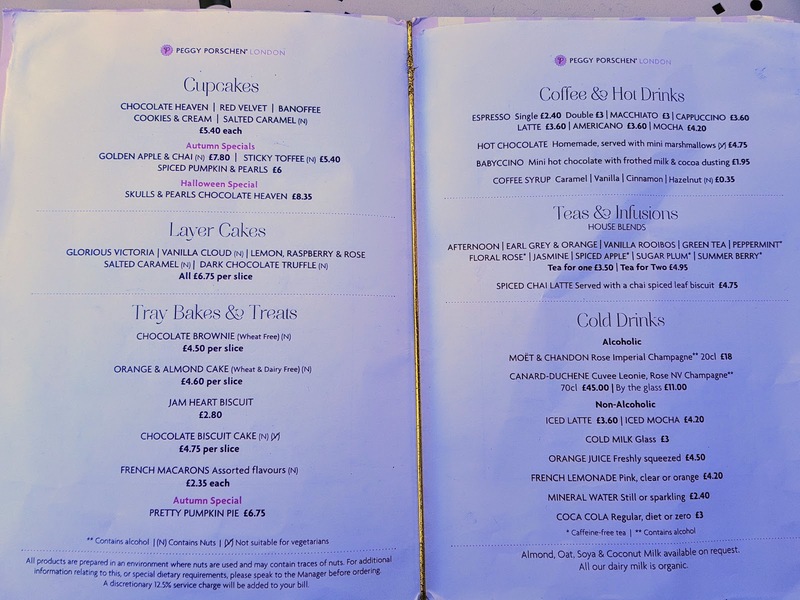 The menu has tonnes of great cakes, exotic teas (including Spiced Apple and Sugar Plum), and hot chocolate - which is one of the most popular orders. Also, helpfully the menu highlights which cakes contain alcohol and which are not suitable for vegetarians. The café also has gluten-free options but unfortunately, they don't have any gluten-free cupcakes. Vegan options are also not available. Obviously, I was spoilt for choice and convinced myself I could eat more than one piece of cake... I mean the cupcakes are tiny right? But you can't (as much as you want to, unfortunately) this places really hits your sweet tooth hard. The hot chocolate is delicious and was an extremely popular order. I ordered the baby chino, which is their smallest size, but at most I'd recommend ordering a medium as the large is quite big for a rich hot chocolate like this one. Having said that, a lot of "premium" hot chocolates I've had are more like drinking a small cup of chocolate (heavy and thick) but thankfully this one wasn't. As for the cake, it was really nice and moist (there is nothing worse than a dry piece of cake). The chocolate truffle cake is a must for chocolate lovers, but the chocolate topping is extremely rich and by the end, I was close to death by sugar. The salted caramel cupcake was great and I recommend it. Usually, I find buttercream icing sickly but they got the cake and icing sweetness just right. Peggy Prorschen is famous for its cupcakes and I can see why. The latté was good but nothing particularly special. 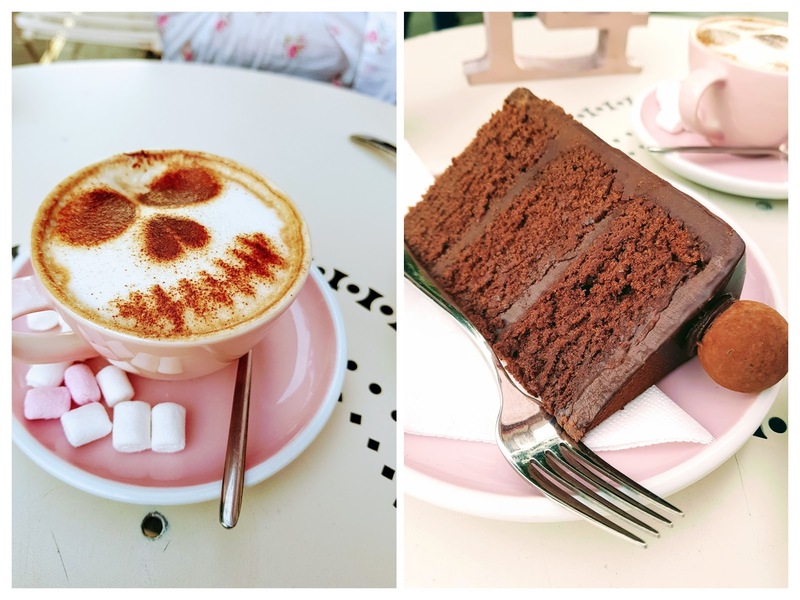 I was a bit disappointed that there wasn't the usual coffee art that you get in most coffee shops, but what can I say, the floral displays raised my expectations of how pretty the food would be, and I'm a creature of habit, I just want someone to draw a heart on my coffee. Service is slow, and I think they even muddled my order and gave it to someone else. But having watched them serve customers for an hour, this seems to have been a hiccup. Generally, all the orders seemed to go smoothly. The staff were friendly, helpful, and completely used to crowds of people snapping pictures. All in all, this is a great little spot if you want to enjoy a relatively cheap and cheerful, but a wee bit special, spot for a tea party. Worth the flower-power visit. P.s drop me a comment if this was helpful and let me know what you thought of Peggy's.